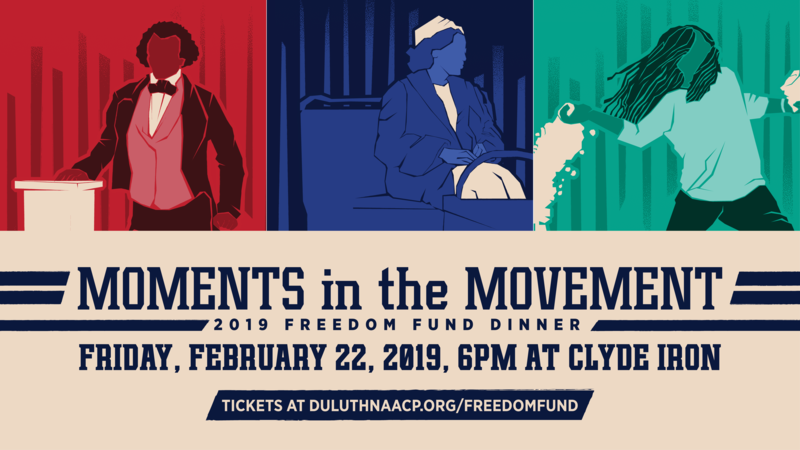 Duluth’s NAACP branch is excited to announce our Freedom Fund Dinner, Reception, & Awards Ceremony! ongoing movement for equity and justice and aspires us to mobilize our communities to continue this work together. The Freedom Fund event is the primary fundraising and ceremonial event for NAACP branches across the country. As a sponsor, your support assists us in securing funds for the event and ensures the support of our ongoing work. Your sponsorship also demonstrates your commitment to the work of the Duluth NAACP branch. In these challenging times of political division, racial injustice and racial inequity, we must build on the past moments of the movement and create new movement moments. There remains much work to be done. To sponsor the events or purchase your ticket(s) to this event, go to: https://2019freedomfund.eventbrite.com. If you require more information, contact us at freedomfund@duluthnaacp.org.